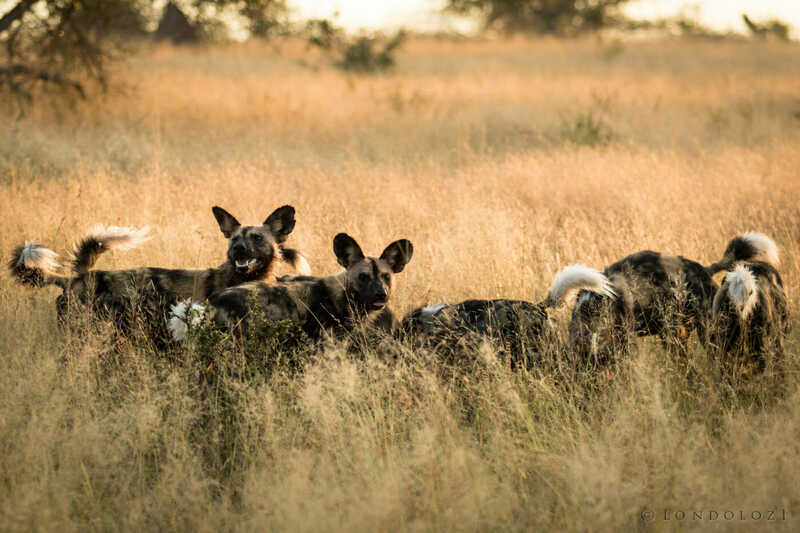 The thrill of following a pack of African wild dogs as they chase down their prey at thirty miles an hour over open ground is something not easily forgotten. 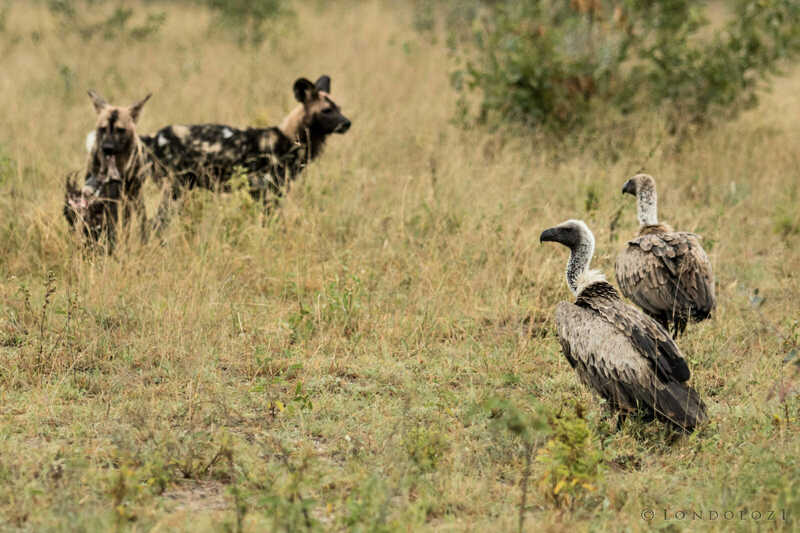 A fair few of our guests here at Londolozi Game Reserve can relate to this experience and it will forever remain etched in their memories.What happened on an eventful day a few weeks ago was no exception. There were four of them in the middle of the road scanning in different directions, breathing heavily in the crisp morning air. They had narrowly missed a herd of impala and were regrouping, deciding where to go next. On silent cue, they began a steady jog down the road through the mist towards a wide grassy crest. We followed them as they fanned out through the bush. Soon they were hot on the hooves of a second herd of impala. Our vehicle was trailing behind, the teary wind rushing past our faces, trying to keep up. 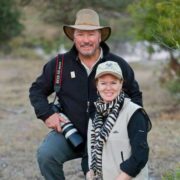 Surrounded by stotting impala – a rocking motion signifying fitness whenever they see African wild dogs – the four predators reined in a family of warthogs which found themselves in the wrong place at the wrong time. They were trying to make good their getaway at full speed, tails in the air like flags, before the lead dog caught one of the subadults by the hind leg. Amidst the dust and distress, the pack satiated their appetites. Natures darker side; the pack of four African wild dogs dispatch a subadult warthog in under a minute. As the energy of the sighting subsided, vultures began to descend, sensing opportunity. Unbeknown to us a second pack of eight was moving in our direction, drawn to the scene by all the commotion. As they emerged into view both packs looked at each other for the briefest of moments before the pack of eight engaged in hostile territorial pursuit of the pack of four, who promptly disappeared into the Combretum thickets to our south. It didn’t take long before we realized that this new drama was moving too far and too quickly to keep up so we returned to the heap of flapping vultures fighting over the scraps, and tried to grapple with the reality of what we had just seen. We had tangoed with Nature’s darker side and through all the adrenaline and excitement we hadn’t even paused to truly appreciate how lucky we were just to see this rare and endangered animal let alone watch them execute a perfect hunt. Sensing opportunity, two white backed vultures wait for scraps. They were the first of many drawn in by the prospect of a meal. The African wild dog, or Cape hunting dog, is the African equivalent of a wolf. 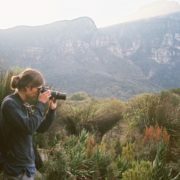 They have a pack-orientated hierarchical social structure and between their voracious appetites, collaborative hunting techniques and a kill rate of up to 70 percent they are arguably Africa’s most accomplished predators. They are the only extant member of the Lycaon genus which split from other canids two to three million years ago. Although they are distant cousins of the wolf and domestic dog, they lack the vestigial fifth toe, or dew claw, found in other canines. At 45 to 55 pounds they are roughly the size of a border collie but with a black, white and sandy yellow coat that was described by writer Natalie Angier as “a furred version of combat fatigues”. In a separate sighting that week, the same pack of eight caught two male impala from the same herd in the same attempt. African wild dogs have a troubled history. Due to the grisly efficiency with which they despatch their prey they were eliminated from South Africa, except the Kruger National Park, by 1920. None were noted in Sabi country between 1931 and 1944 where previously they had flourished. It was only in the mid 1980’s that they became a protected species, but disturbingly, their numbers are still in decline. According to Mitch Reardon in his book Shaping Kruger they have been evicted from 25 of 39 countries that encompassed their former range. 60 percent of known populations traverse international boundaries which compounds and complicates monitoring and conservation efforts. The exact cause of their continual decline remains a mystery but loss of prey, direct persecution, habitat destruction and modification as well as susceptibility to diseases carried by their domestic cousins, have reduced them to fragmented subpopulations, dangerously isolated both genetically and geographically. With approximately 5750 African wild dogs left, the majority occurring in South- Eastern and Southern Africa, they have become Africa’s second most endangered carnivore, after the Ethiopian wolf. An adult female fitted with a radio collar, the key to the conservation of Africa’s second most endangered carnivore. These inveterate wanderers, as Reardon puts it, live on the move and when game abounds they can range over 1500 square miles (3885 square kilometers). Radio collars are used by conservation authorities to locate them once a month in order to determine their location and composition. This information helps to determine factors affecting wild dog distribution, numbers, movements and density. Just seeing one in the wild is akin to a safari gold medal and for a species that has been on the sharp end of persecution for so long, we are incredibly fortunate to have regular sightings on Londolozi Game Reserve. on Is Seeing the African Wild Dog Tantamount to a Safari Gold Medal? 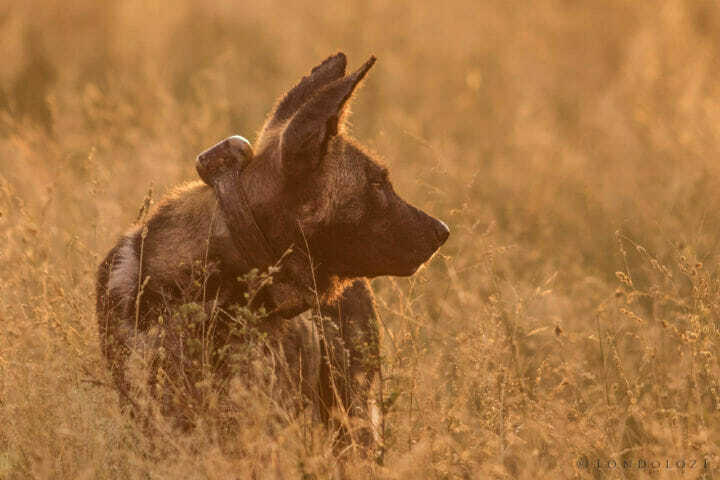 Wonderful blog about wild dogs Paul. They are my favourite predators, maybe because they are so endangered. We are fairly regularly in the bush and see them maybe if we are lucky only once or twice a year. The image of the pack of four sizzles with the intensity of the hunt. Coupled with their coloring, they certainly portray the darker side. 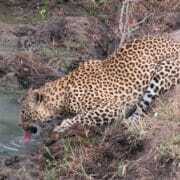 Happy to hear that they live in Londolozi and hope their numbers will somehow increase. Thank you Joanne. I was fortunate to get an image i was happy with in amongst the chaos. Great post, thanks Paul. Really enjoyed the mix of storytelling and factual information. Thank heavens the days of van der Post and others who killed so many beautiful creatures, are over. Alas, the endangered are not nearly out of the woods yet. Live on Lycaon pictus!! I was very lucky to see a hunt from start to grisly finish. Been lucky to see packs in Botswana and Tanzania. Sounds a very special sighting. 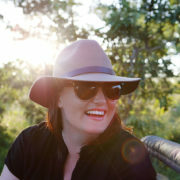 I should have added the hunt was at Londolozi and the driving by Simon that day was stunningly good. Very true Ian. If and when i have enough images of a pangolin i’ll certainly write about it. Thank you for your comments. Totally fascinating informative blog. I have to admit the thrill of their hunting prowess is exhilarating, even knowing what the aftermath might be. I’ve been fortunate to see these amazing killing machines in action in both Sabi Sand and Tau Pan with the former pack of nine successful whilst the latter pack of 6 gave up the impala chase , walking away, tails between legs! I find their coloration to be beautiful and it lends to their camouflage within the bush. I look forward to more encounters watching this incredible predator. Thank you Denise. I’m glad you enjoyed reading it. My first ever sighting of wild dogs was a pack of about 30 at 6 in the morning on our first morning in Moremi on the 2nd January this year, and I will never forget it! 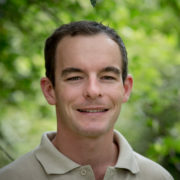 Paul, We enjoyed reading your blog and appreciated your detailed writing style! Must have been thrilling to see two packs in one sighting. It’s also sad to hear that they are continuing to decline in their numbers! Thank you Michael and Terri! 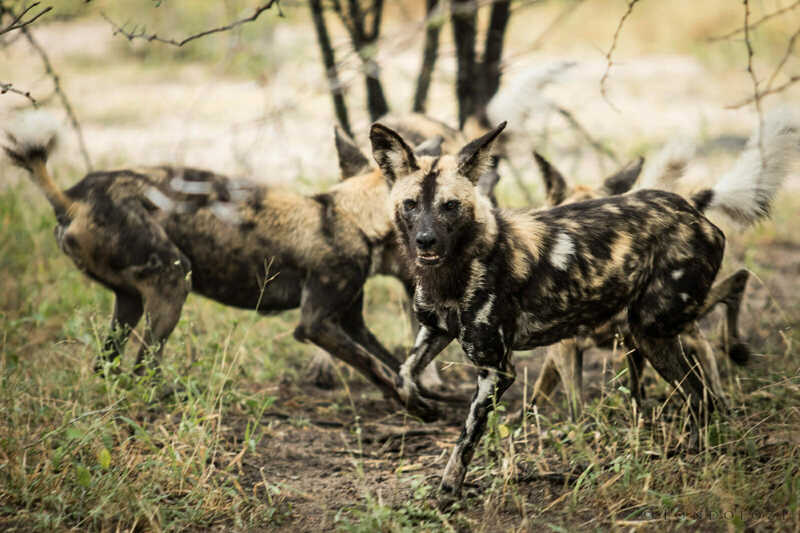 Enjoyed this report from the bushveld; it is good to read that wild dogs persist (tenuously, it appears) despite a collection of forces – including human attitudes – more formidable than those antagonistic to the health of other larger predator populations. But having lived (to the extent that they allowed me!) with these magnificent animals for over three years in KNP and surrounding reserves in the mid-late 70s, I do have to take issue with the reference to a ‘dark side’. There is no dark side to Lycaon. Absolutely none at all. But a world without them would be a dark world indeed. Hope they will brighten my days when I return to South Africa next year! Well said Allen. Thank you for commenting.